Nominations are now open for the UBC Faculty of Education Alumni Teacher Award, which was established to highlight the significant impact UBC education graduates are having on teaching and learning in schools throughout BC, Canada, and beyond. Please visit the Alumni Teacher Award page for nomination forms and more information. 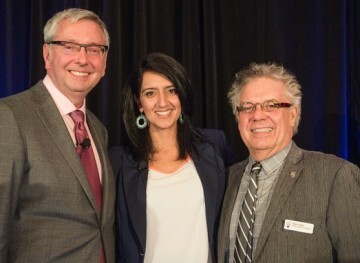 L – R: Professor Toope, President of the University of British Columbia, Harpreet Dhillon, 2013 Alumni Teacher Award Winner, and Dr. Blye Frank, Dean of the UBC Faculty of Education.